Practice intercropping only when mango trees have attained a suitable height and developed a canopy. Cultivation is not advisable at the early stages as it will disturb the soil as well as damage the active developing roots. When weeds are plenty, cut them down. Do not employ clean weeding around the base of the tree instead employ mulching to control the weeds. Rice straw, rice husk, saw dusts, and dried weeds are good mulching materials. Fresh coir dust is not recommended as it emits substances that may interfere with the tree growth (PCARRD/UNDP, 1999). Inspect tree regularly when mulches are used because these encourage termites’ activities. Also, watch out for fire occurrence during dry season. Do not apply fertilizer after transplanting until the new flush is seen. Apply fertilizer before or after rainy seasons. Generally, no top dressing of organic manures is employed for mango, by mango growers. But when available, add 10-15 kg of cattle manure or compost to each bearing tree 2 weeks before applying of chemical fertilizer (FADINAP, 2000: pp. 115-117). Pruning is practiced to shape young trees, to attain the desired size and shape of the crown, and to eliminate undesirable and diseased branches. In Thailand, annual pruning of water sprouts and overlapping branches is done. In the Philippines, pruning is done after harvest to prepare the tree for the next bearing season, to increase fruit production, and improve the quality of fruit. In Malaysia, pruning is done to control the size and shape of the tree and to maintain uniform canopy growth and fruiting. In India, pruning is employed to allow development of a strong open frame that is well-spaced and has a spread canopy. Mango sap and debris irritate skin that can cause severe dermatitis. Take extra care while pruning trees. Hot water treatment (HWT) is an effective post-harvest treatment for mango. Dipping newly harvested fruits in hot water minimizes fruit fly damage, anthracnose, and stem-end rot infestations. A study entitled “Disease control in the Philippines carabao mango with post-harvest hot water treatment” showed that disease incidence in fruits decreased significantly when dipped in hot water (53°C for 5 or 10 minutes), with the 10-minute dip providing more effective control. Bagging and a 10-minute hot water dip resulted in the least disease. Anthracnose was reduced by 83% and stem-end rot by 100%. Fruit fly damage was reduced by 80%. Neither bagging nor hot water treatment affected total soluble solids at the table ripe stage (Buganic; Lizada; de Ramos, 1993). Another study entitled “Hot water treatments for the post-harvest control on fruit fly and anthracnose in the Caribbean mango, Julie” showed that hot water treatment with temperatures ranging from 45°C to 55°C for varying time durations of 45 to 65 minutes controlled fruit fly (Anastrepha obliqua) and reduced anthracnose in Julie mangoes. Results further showed that there were no effects on fruit quality including peel color, texture, weight loss, total soluble solids, acidity, and fruit shriveling (McIntyre; Wickham; Wilson; Malins, 1993). Buganic, R.; Lizada, M.; de Ramos, M. (1993): Disease control in the Philippines ‘Carabao’ mango with post-harvest hot water treatment. IV International Mango Symposium, Acta Horticulturae 341. ISHS, USA. DOST. (2003): Mango publications. Department of Science and Technology. Manila, Philippines. PCARRD/UNDP. 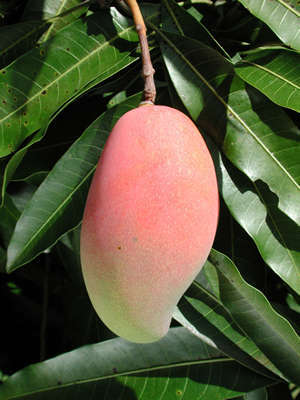 (1999): Mango production manual. Philippine Council for Agriculture, Forestry and Natural Resources Research and Development/United Nations Development Programme. Los Baños, Laguna.